Want to experience a vacation in Gatlinburg with an outdoor fire pit? Simply reserve one of these cabins in the Smokies with fire pits! These rentals are ideal for guests who want to spend time in the great outdoors since they offer outdoor campfire that keeps you warm even on chilly mountain nights. Whether you want to roast hot dogs, tell spooky stories, or just enjoy a night of star-gazing with family and friends, you'll love staying at your very own cabin in Gatlinburg with an outdoor fire pit. Reserve your cabin with a fire pit today with Cabins USA Gatlinburg to save 15% on your nightly rate in the Great Smoky Mountains of Tennessee! Welcome to "Bare Kissin and Huggin," a 1 bedroom Sevierville cabin that comes complete with a hot tub, fire pit, jacuzzi, and more in the Smoky Mountains! Welcome to "Bare Tubbin" a 1 bedroom cabin by Cabins USA Gatlinburg in the Smokies that comes with a fire pit, hot tub, jacuzzi, and a special discount! Looking for a 1 bedroom cabin with a creek and a hot tub? Check out "Cuddle Creek Cabin" in Sevierville near Pigeon Forge, Tennessee! Looking for an anniversary cabin in Gatlinburg? Take a look at Huggable Hideaway between Gatlinburg and Pigeon Forge in Sky Harbor. "Kicked Back Creekside" is a lovely 1 bedroom cabin in the Wears Valley area of Sevierville with a pool table, hot tub, and a 15% cabin discount! Enjoy this pet friendly cabin in the Smoky Mountains. Moose Lake Lodge is a 1 bedroom dog friendly cabin with hot tub, jacuzzi and more! Welcome to "Turtle Dovin'" a 1 bedroom cabin with a hot tub, fire pit, and a creekside location near Pigeon Forge, TN with a 15% discount rate! Ready to experience your own river cabin in the Smokies? This romantic 1 bedroom cabin is ideal for honeymoons and comes with a 15% discount! Book this romantic cabin in the Smokies with river views and you'll enjoy a hot tub, a heart-shaped jacuzzi, and a fireplace during your honeymoon! Wears Valley TN cabin rental with theater room, game room, Internet access and more awaiting your escape to the scenic Tennessee Smoky Mountains. Plan your vacation to a cabin near Gatlinburg with a private pool! "Hickory Splash" offers a private 2-bedroom cabin with heated pool on the bottom level and WiFi. Book a premium cabin with a fire pit, game room, and hot tub in Richardson Cove near Dollywood! "Sweet Seclusion" is a 2 bedroom cabin in a private location. Bring your family and friends to a cabin that's "2 Tranquil 4 Words!" This 2-bedroom rental sleeps 10 guests in a beautiful Smoky Mountain setting. Enjoy a Smoky Mountain cabin with a fire pit in the beautiful Wears Valley area! Book "A Hummingbird Hideaway" to earn a discount rate on your cabin! Book this secluded 2 bedroom cabin with a fire pit with Cabins USA Gatlinburg and you'll save 15% on your nightly rate in the Smoky Mountains! Cabin for rent in Wears Valley with views! Enjoy spectacular 280 degree Smoky Mountain views from your Tennessee Smokies cabin rental. Online Cabin Special! Take a vacation at a comfortable, non-smoking cabin near Gatlinburg at "A Bear Adventure" and receive a 15% online booking discount! Want a Smoky Mountain vacation on the lake? Simply book "Ivey's Cove," a 2 bedroom log cabin with a dock on Douglas Lake in Sevierville, Tennessee! Looking for a cabin with a private location and a hot tub for your Smoky Mountain vacation? Look no further than "Little Bit Of Fun" from Cabins USA Gatlinburg! 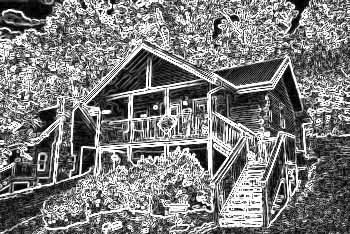 "River House" is an affordable 2 bedroom cabin that's located right on the Little Pigeon River in the Smoky Mountains. Book this cabin today to save with our cabin discount! Come experience "4 Paws" in the beautiful Smoky Mountains of Tennessee! This 3-bedroom log cabin comes with a game room, fire pit, hot tub and a discount! Looking for a luxury cabin that offers a secluded location and gorgeous mountain views? Check out "Simply Incredible," a premium 3 bedroom cabin rental! Experience "Campfire Lodge" during your next trip to the Smokies in a beautiful, secluded location complete with a hot tub, pool table, fire pit, deck, and more! "Sea of Clouds" is an excellent 3 bedroom cabin that sleeps 6 guests in the Upper Middle Creek Road area of the Smokies near Dollywood with a fire pit & mountain view! Welcome to "Creekside Cottage" in the Great Smoky Mountains of Tennessee! Book this rental with a creek and a fire pit today & save 15% on your rate! "Hideaway Dreams" is a stunning 4 bedroom cabin in Wears Valley in the Smoky Mountains that boasts views, a game room, a theater room, and corn hole. Book this excellent 5 bedroom chalet rental in the beautiful Upper Middle Creek road area of the Smoky Mountains and save 15% on your nightly rate! "Amazing Grace" is an excellent 6 bedroom cabin in Sevierville that sleeps 16 guests and offers a private indoor swimming pool for your getaway! Come experience "Bluff Mountain Lodge," a 6 bedroom cabin in Wears Valley with mountain views in the Great Smoky Mountains of Tennessee! "High Dive" is a luxury cabin complete with a private pool, a game room, theater room, and an outdoor area with a fire pit! Looking for a 12 bedroom cabin close to Dollywood Theme Park? "Dream Maker Lodge" is the luxury group cabin you've been looking for!